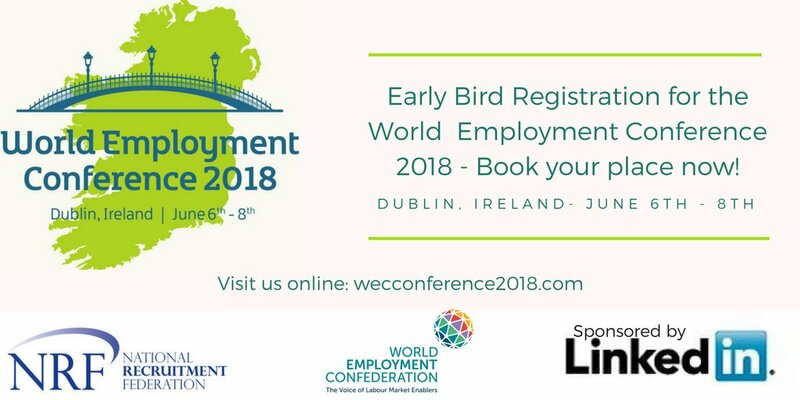 Registration for the World Employment Conference 2018 in Dublin is open! Hosted by the National Recruitment Federation and the World Employment Confederation, the World Employment Conference takes place from the 6th to the 8th June 2018 in the Clayton Hotel, Burlington Road, Dublin. This international conference will educate, inspire, be highly interactive and will allow you to network with others in your sector. The programme will include keynote speakers, master classes, plenaries, networking opportunities and a great social programme. Frons Trompenaars is the Founder and Director of Trompenaars Hampden-Turner, an intercultural management firm. He has spent over 20 years helping Fortune 500 leaders and professionals manage and solve their business and cultural dilemmas to increase global effectiveness and performance. Mary B Lucas has more than 30 years of experience working in the “People Business” which is how she describes the staffing industry. Along the way she has coached individuals at all organisational levels to successfully reach goals, enhance working relationships, improve employee retention and elevate team performance. David Collings, the Professor of HRM at Dublin City University Business School in Ireland where he is co-director of the Leadership and Talent Institute. Peter Cosgrove, Founder of the Future of Work Institute. Johnny Campbell is Co-founder and CEO of SocialTalent – a SaaS learning technology company changing how people work and driving the future of learning across the world. Plus more to be announced as the full programme will be published very soon. How to register: Those interested in attending the World Employment Confederation Conference should register through the link below, Early Bird registration is open until the 9th March 2018. If your organisation is a member of the National Recruitment Federation, a membership registration offer has already been emailed to the NRF contact within your company. Should you have any queries, please contact Karen Hoey at Happening Conferences to verify. For more information please contact Karen Hoey: karenhoey@happeningconferences.com on +353 1 531 4118.